LENEXA, KAN. – Soaring 90 feet tall, Saint John’s Cathedral would be intimidating to anyone — especially the team assigned to re-roof the massive structure. 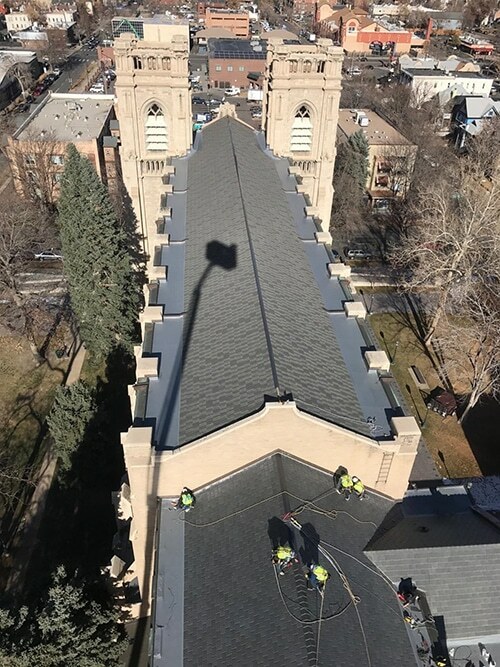 However, the experts at Horn Brothers Roofing jumped at the opportunity to install 245 squares of DaVinci Roofscapes composite tiles on one of Denver’s most historic buildings. “This is definitely an older structure and officials involved in historical renewal in Denver wanted the project done right,” says McMillan. “We took time to fully examine the entire facility and make product recommendations. The lift was used to off load 103 squares of brittle, heavy slate in a lift bucket. The weight of the slate turned this into a very time consuming process. As the project moved to different locations, each area — including sidewalks, the school zone, parking lots and entry ways to the church — were secured and monitored. Due to the very close proximity of schools to the church extra precautions were in place in the mornings and when school let out. Now securely installed, the new roof has eliminated worries of falling old slate tiles while adding more beauty to the church exterior. While parishioners are pleased with the look of the new roof, they’re waiting for severe weather to prove their investment was a wise one. 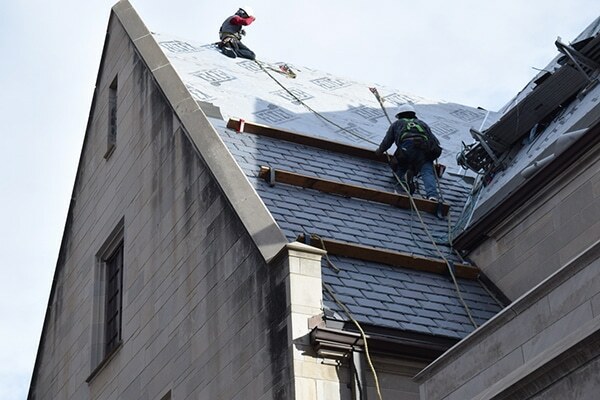 “We’re happy to have this roof overhead, but we’re really waiting for a few years and some bad storms to hit to truly see how the impact-resistant roof holds up,” says Judy Allison, who served as director of facilities at Saint John’s Cathedral during the re-roofing process. “This was a very large project for us. We first had to gain approval from several groups within the church and then from the Denver Landmark Preservation Commission.